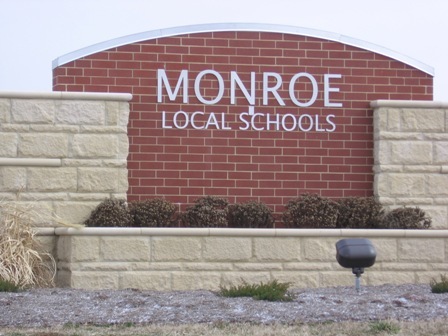 On Tuesday, Monroe voters rejected an emergency operating tax levy for Monroe School District by less than four percent. The emergency operating tax levy was to generate $2.5 million a year for the school district. With an operating budget or $2.2 million and a bond retirement debt of $3.1 million (which according to the school board, the bond retirement debt funds were moved by former school treasurer, Kelley Thorpe, without the school boards approval), the district was placed under fiscal emergency on May 10 by Auditor of State, Dave Yost and a state-appointed finanical planning and supervision commission was formed shortly after. The state auditor's office found 14 accounting errors and soon after the school district filed a lawsuit against Kelley Thorpe. Monroe School District is the first Butler County school district to be labelled as under fiscal emergency. The state commission has until September 27 to develop a financial recovery plan. The unofficial results from the Butler County Board of Elections had the final margin at 1,123 votes against the levy and 1,044 votes for the levy, or 51.8% to 48.2%. The failed levy on Tuesday could lead to additional cuts, perhaps in athletics, extracirricular programs and possibly even more teaching positions. The Ohio Department of Education Financial Planning and Supervision Commission and the Monroe school board have approved a resolution for placing a levy on the ballot in November.